OK, “confine” is probably too strong of a word to use, but my radius of travel has definitely decreased, as well as the frequency with which that travel occurs. I will still be resting for another week, my employer graciously allowing me to do as much work as possible from the comfort of our home. These are two, somewhat equal, skeins of superwash merino. The roving was dyed in a 4 oz. bump. I split the roving lengthwise and spun a three-ply (navajo) yarn with 150 yards on one, and 160 yards on the other skein. Virginia, barely waiting for the yarn to dry from setting, has already started a pair of socks with this. Finished yesterday, this fun skein was spun from a 50/50 blend of merino/tencel top. It’s my first time spinning with tencel… not sure what to think. If it’s supposed to be a substitute for silk, I’ll take the silk. 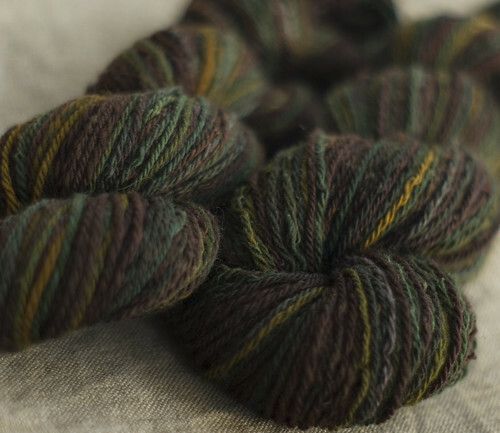 Still, fun colors, a gratifying little project, and the 190 yards from a 3 oz. bundle will make a funky scarf. 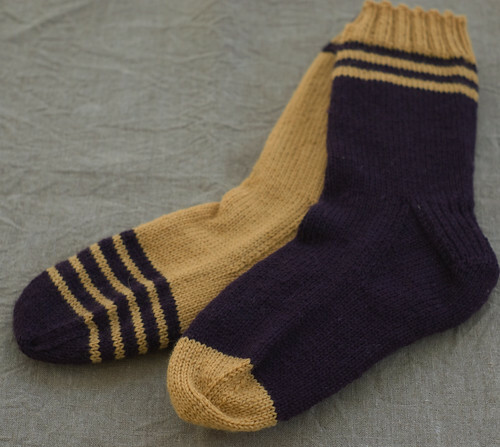 Lest you begin to worry about the lack of socks being posted, Virginia, filling a special order for someone wanting to show his support for the Vikings (even in post season), knit these using SmartYarn. I suspect there will be more spinning content in the next several days. For the record, though, I am starting to get a bit behind at work, so this coming week will be a good test of will power and discipline. Oh, confined, that stinks! But at least you can get some spinning done, right?? I wish I could be confined to my house for a month. 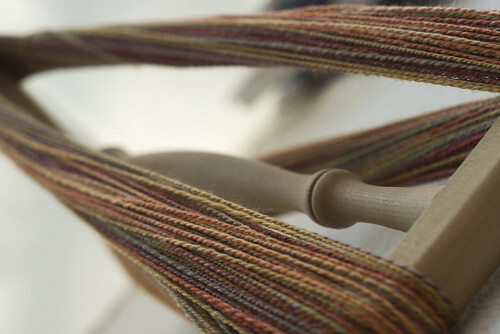 There is so much to be accomplished in terms of spinning and knitting. We will talk about the housework to be accomplished at another time. That is always a given, but to just knit and spin, oh what a joy. Hope you get better.